And Here’s What You All Have To “Look Forward” To. Anyhow, this isn’t a real post because I’ve been away so long my brain short circuited trying to decide what topic to start with. *Courtney’s Culinary Adventures – possible alternate title – WTF Mama Why WOULDNT I put Cream Cheese in Baked Spaghetti? – other alternate title – How Not to Lose Weight Whilst Cycling Six Miles a Day. *Why I Am Awesome at the Neighborhood Watch. *Being 83 in a 34 Year Old Body and Why Apparently it IS Important to Not Wear Flip Flops from Walgreens – Alternate title, Why No One Wants to Go Anywhere With Me Unless it is Less than a Block Away. 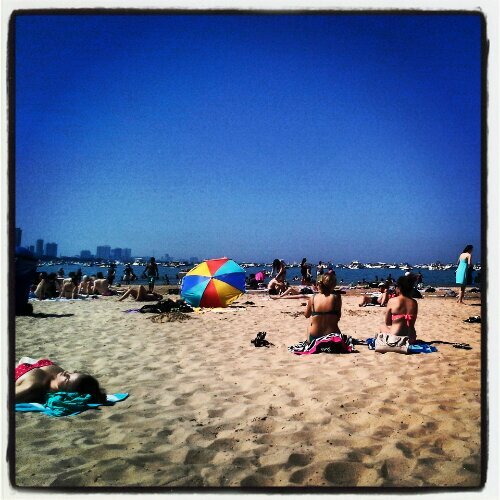 So that’s what’s been happening here…..
Posted on 07/17/2013, in Chicago, family and friends, general stupidity, life in general, Uncategorized and tagged beach, Chicago, fourth of July, friends, summer. Bookmark the permalink. Leave a comment.